Airpath offers several choices for PMP solutions covering the whole unlicensed RF spectrum. Refer to the products page to find out more about Airpath's fine assortment of PMP wireless data networking products or continue to explore the Technology topics to help you understand which specific products are best suited for you. A short description of the complexities and challenges to why PMP systems are needed. Airpath's PMP solutions cover unlicensed and licensed RF spectrum. 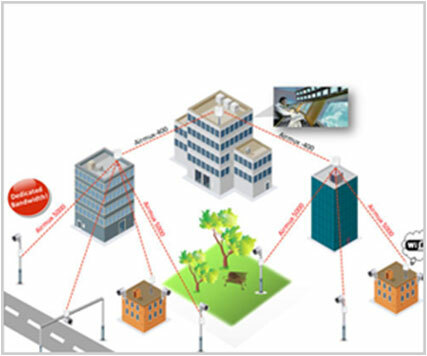 Point-to-Multipoint (PMP) RF data networking refers to the use of wireless (RF) technologies to create one or more data links. These data links all originate at a single location (the "point" of PMP) and fan out to various other locations. PMP applications vary in their needs for distance and data throughput. Numerous PMP products for the home can now be purchased at your local computer stores. However, the technologies for these solutions provide what is commonly referred to as "hot-spot coverage". Hot-spot coverage is coverage distances measured in feet/meters. In contrast, non-hot-spot technologies provide coverage over distances measured in miles/kilometers. PMP systems have two added complexities that PTP systems can ignore. (1) That of controlling the RF space when multiple radios all want to use the same RF channel at the same time. And, (2), that of now being required to intervene in the data network control. RF-space control is frequently performed through TDMA (Time Division Multiple Access) technologies. There are many TDMA technologies some of which are determined by standards and others that are proprietary. Proprietary technologies have the advantage of being able to offer additional benefits but standards offer the advantage of possible interoperability between equipment from different manufacturers. Because PMP systems must now get involved in the control/management of the flow of the data, the key question becomes what sort of network services are offered. Most PMP systems support Ethernet bridging; few offer the ability to support IP routing; fewer yet offer you the choice.